SciDev.Net is the world’s leading source of reliable and authoritative news, views and analysis on information about science and technology for global development. There are lots of ways to become part of the SciDev.Net community and contribute to SciDev.Net – from commenting on articles to following SciDev.Net on Twitter and setting up an RSS on your website! Today SciDev.Net is a company limited by guarantee and a registered charity in England and Wales (registered charity number 1089590). Though main office and Global edition are based in London, SciDev.Net has a worldwide network of registered users, advisors, consultants and freelance journalists, predominantly from developing countries, who drive SciDev.Net’s activities and vision. Regional editions in different languages (English, Arabic, French and Spanish) can be explored at: Latin America & Caribbean, Middle East & North Africa, South-East Asia & Pacific, South Asia, Sub-Saharan Africa (English), Sub-Saharan Africa (French). The website SciDev.Net - easy touse with improved navigation and logical website architecture - provides: access to accurate, understandable information for an audience interested in supporting the improved well-being of the poor in the global South; analysis of research findings, exploring socioeconomic implications and facilitating local relevance; capacity to support and sustain uptake of research, including working with partners to provide specialist training on communicating science; space and incentives for key relationships with champions of science and technology. 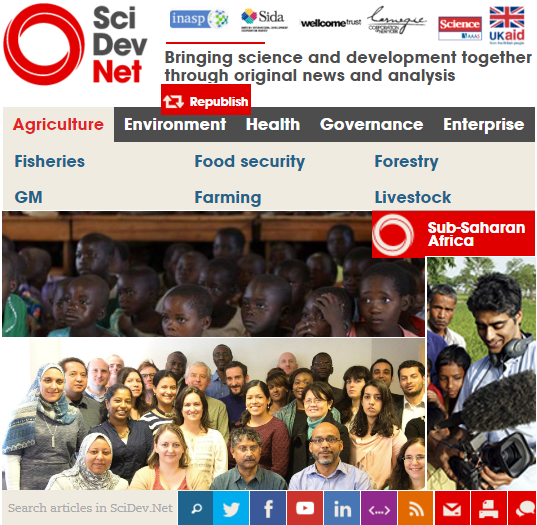 SciDev.Net is committed to putting science at the heart of global development and is engaged primarily with development professionals, policymakers, researchers, the media and the informed public driving SciDev.Net’s activities and vision across the globe. The main mission of SciDev.Net is to help individuals and organizations apply evidence and insights from science and technology to decision-making in order to have a positive impact on equitable and sustainable development and poverty reduction. 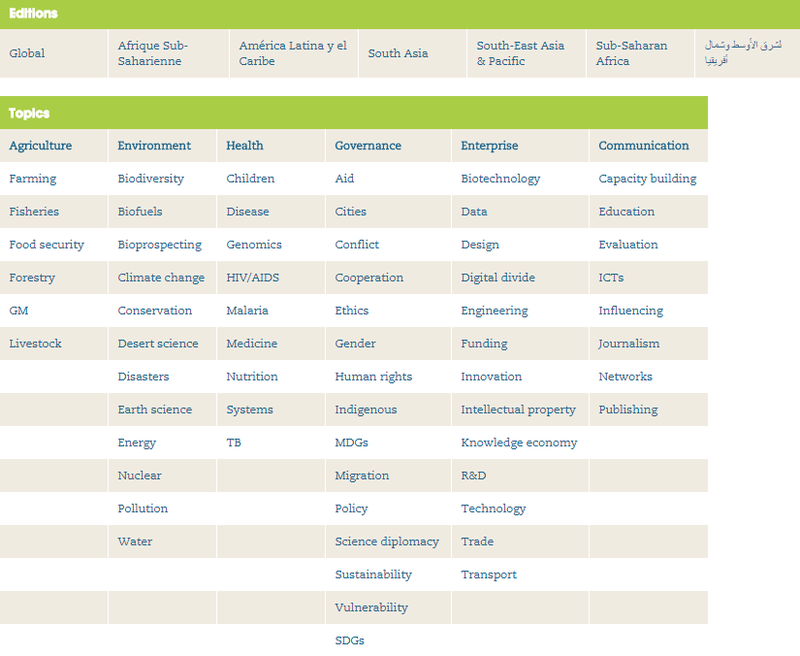 The purpose of a new SciDev.Net’s strategy for 2013–2017 is to consolidates SciDev.Net’s achievements over the previous 12 years of its existence and to encourage science and technological awareness in policies, programmes and projects contributing to the wellbeing of the poor in the developing world. This can be achieved by facilitating access to information that is useful and trustworthy, as well as supporting the capacity to deliver and sustain this mainstreaming strategy. Based on research around SciDev.Net’s Global Review 2012 there are four key supporting factors that SciDev.Net can provide to facilitate the mainstreaming of more science and technology evidence for development. SciDev.Net encourage Freelance News Writers to contribute to SciDev.Net. For more information on writing for SciDev.Net, please click here. SciDev.Net wants more people to be able to read and use its work, available for republishing online or in print for free under a Creative Commons Commons Attribution licence 2.0. SciDev.Net strives to continually learn and understand from its audiences. Feedback information helps SciDev.Net provide its users with specific information and increase its contribution to key areas of development. 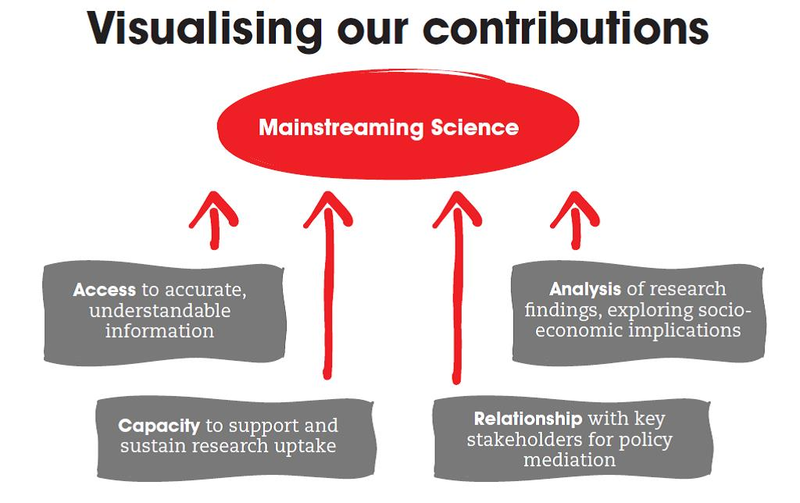 The results of last year's survey were published in SciDev.Net Learning series report Mapping the impact of science journalism. All users can tell SciDev.Net their story here. Much of SciDev.Net’s work is made possible through its strong relationships with organizations that share SciDev.Net’s values and goals.